With St. Patty's Day right around the corner, we knew there would be corned beef and cabbage for Sunday dinner as it is certainly a favorite in my family, but whenever we have something we have cooked for years I like to try something new for an appetizer. This was voted on by the committee and with the perfect weather outside on Sunday afternoon, I sat on the porch enjoying the warm rays of early spring and relaxed as the tomatoes roasted. It was perfection and so was this recipe! Preheat the oven to 300 degrees. Place the tomatoes cut-side up on a parchment paper lined baking sheet. Drizzle with extra virgin olive oil and sprinkle with salt, pepper and thyme. Roast 1 hour, then turn heat up to 400 degrees and roast an additional 30 minutes, or until the tomatoes are very soft and slightly shrunken. For the last 8 - 10 minutes, place the baguette slices on a baking sheet, and bake until golden brown. You could drizzle the slices with EVOO also if you desire. 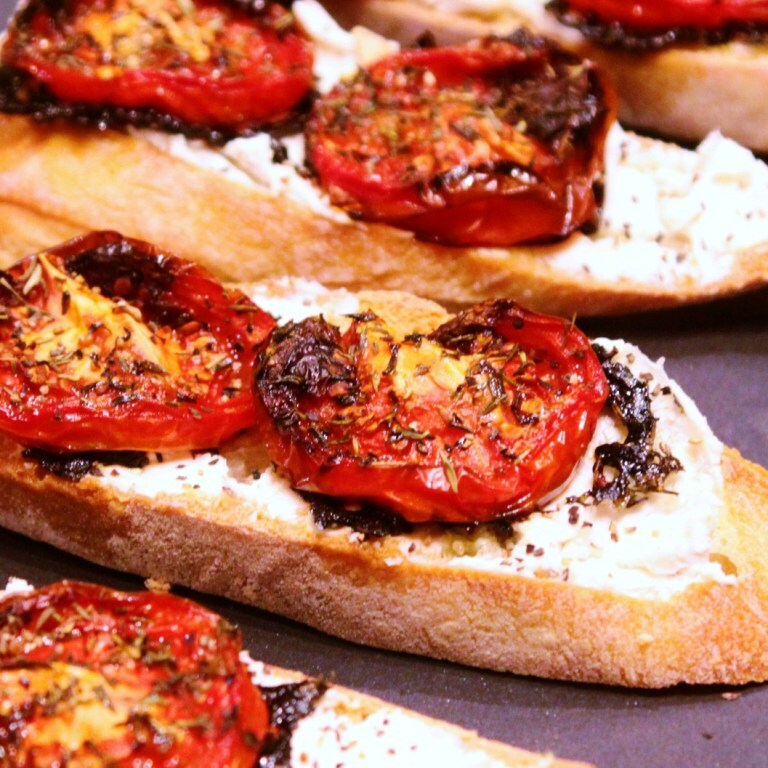 Spread some herbed goat cheese on each warm crostini and top each with the roasted tomatoes.